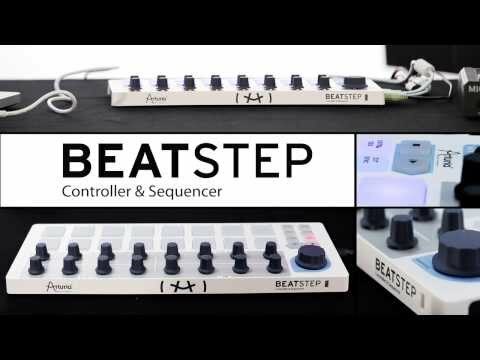 The Arturia Beatstep is a versatile USB pad controller, offering extended functionality for your music software or external hardware synthes.. The Arturia Beatstep is a versatile USB pad controller, offering extended functionality for your music software or external hardware synthesizer. Beatsteo features two operation modes - Red LEDs enable the 16 velocity-sensitive drum pads to trigger sample playback in a plug-in such as BFD, Battery or EZdrummer. Blue LEDs enable a 'Step Sequencer' mode to send to MIDI synthesizers or keyboards. 16 rotary encoder knobs also allow for dedicated control over any virtual synth parameter to allow for easy automation and patch editing, whilst CV and MIDI outputs provide additional connectivity to your external hardware. The Arturia Beatstep features a slimline design and size that makes it perfect for the laptop DJ or producer, whilst an additional iPad camera connection kit (sold separately) opens it up for use with iOS devices and mobile apps.